Project management involves planning, organization, and discipline to follow procedures and policies to ensure tasks meet their deadlines and stay within budget. This usually involves working with multiple members on a team to achieve pre-determined goals and objectives. Quality control checks by a project manager might also be involved to make sure things are up to a certain standard. WordPress has some creative solutions for managing your projects right within your dashboard. We have gathered up the top six WordPress project management plugins which can help you stay organized and on task. Note: These are listed in no particular order. Let’s start with the free WP Project Manager plugin, developed by the guys over at weDevs. These guys have been in business since 2008 and have a large team that actively maintain their plugins. For managing projects within your WordPress system, WP Project Manager allows you to move your management functions in-house as opposed to having to log in to an external site multiple times a day. WP Project Manager has a premium version, starting at $59/year for a single license, which includes additional features such as unlimited users and projects, a front-end feature, as well as priority support. They also have premium add-ons available which you can use to extend it even further, such as Gantt charts, time tracking, invoices, and subtasks. CQPIM is a premium full-feature project management plugin for WordPress, available only on CodeCanyon for $38. It was originally designed by an in-house web agency to fulfill their client’s needs and eventually decided to launch it full time based on feedback and lack of WordPress project management plugins on the market. Dashboard alerts for quotes, projects, invoices, support tickets, etc. There is much more to this plugin, too many features to list! It currently has over 1,000 sales with a 4.5 out of 5-star rating. UpStream is a free project management plugin that allows you to easily manage any type of project, right from within your WordPress website. 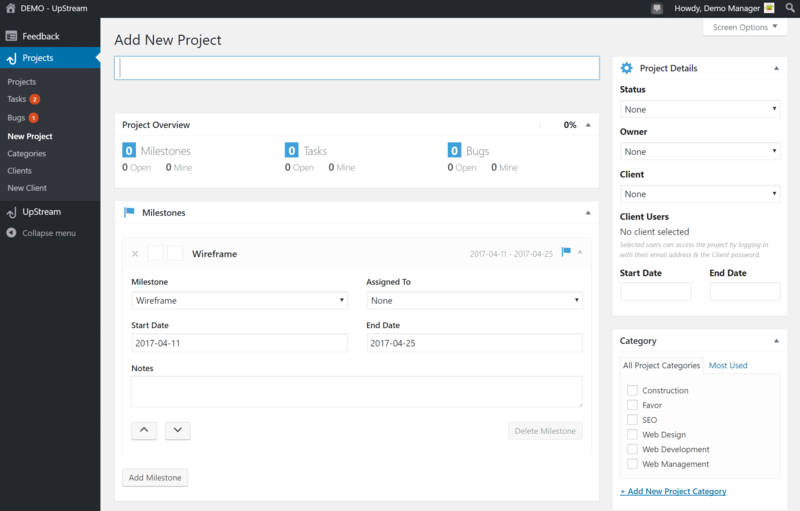 Your clients can track the progress of their project via the front-end project view. They also have premium extensions which allow you to add front-end editing capabilities as well as project timelines. The plugin even got a big thumbs up from Steve Burge, founder of OSTraining. 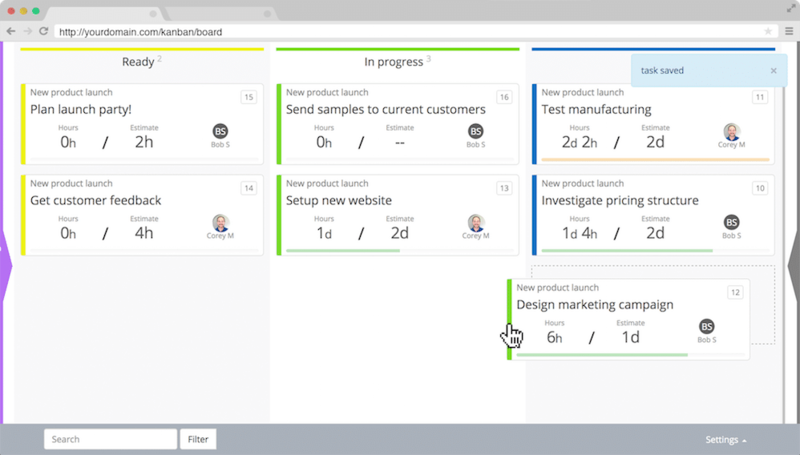 Kanban boards are best known for agile project management and has a very similar feel to Trello. You can use it to track sales, editorial calendars, and more. It has a lot of integrations with popular WordPress plugins such as Gravity Forms and Ninja Forms. They also have premium add-ons available which allow you to extend its functionality by enabling multiple boards, advanced user management, task comments, task colors, task attachments, and even notifications. Project Panorama is a WordPress project management and communication plugin designed to keep your clients and team in the loop. One of the most outstanding features of the plugin is visualization: the overall look of the projects makes your tasks easily trackable and evident, the beautiful and simple charts showing the progress will help you follow up on your deadlines. You can add milestones to all of your projects and set milestone frequency, as well as assign a title and description to each milestone. These data will be displayed in a simple but spectacular chart so you can easily keep on track of your business. To fine-tune the categorization of your projects, you can define custom project types yourself, so you’ll be able to filter out your closed projects for example if necessary. When you already have a huge list of projects and want to create a new one, Project Panorama will lend you a helping hand in making the steps easier. With its cloning tool, you can easily copy an existing project. Just go to “All Projects” and hover over the one you’d like to copy. Click on “Clone”, and a new draft project will appear. It’s a lot faster to only change some details than starting the whole project creating process from zero. The dashboard for the plugin looks beautiful! They also have an extensive premium version available which allows you to assign phases, upload and store documents, protect projects with passwords, and set security protocols. For businesses who are working with clients and aim is to involve them in the projects or just showcase the progress for them in an elegant way, we’d recommend getting the premium version. Smarty Pants is a robust WordPress project management plugin with many great features. Developers divide the features into administrator features and client features then pile premium features on top of those. As an administrator, you have complete control over user access. You can upload files to each client and project page and get an overview of the last 50 client uploads. You can also add staff, suppliers, vendors, subcontractors, and partners. Users at all levels can create projects according to your permission parameters. Clients can upload multiple files, delete files, and search for files by name. They also have the ability to rename files. Prices range from $75 to $575 for lifetime support, but you can also get a 30-day free trial. 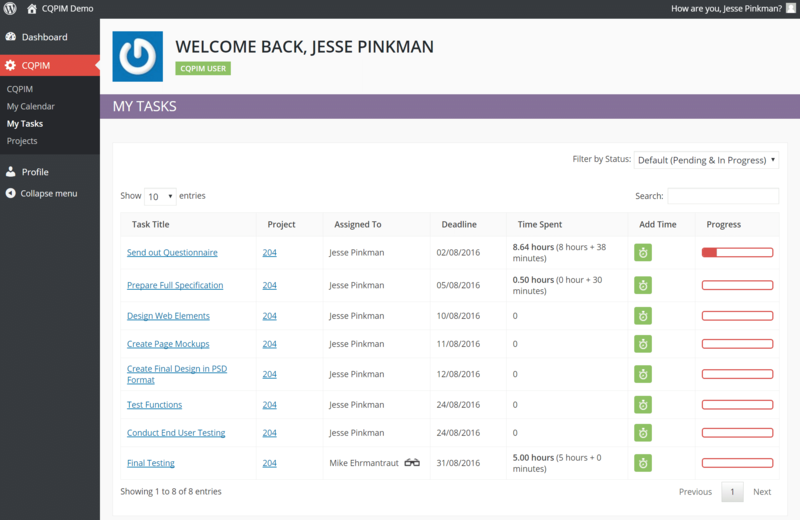 There are a lot of great project management and task management tools outside of WordPress. Drag is a cool example of one that organizes your Gmail into task lists, just like Trello. People spend over 6.3 hours per day in their email, so it makes sense to have your task management in the same spot. Or check out this list of the best project management tools used by top technical teams. 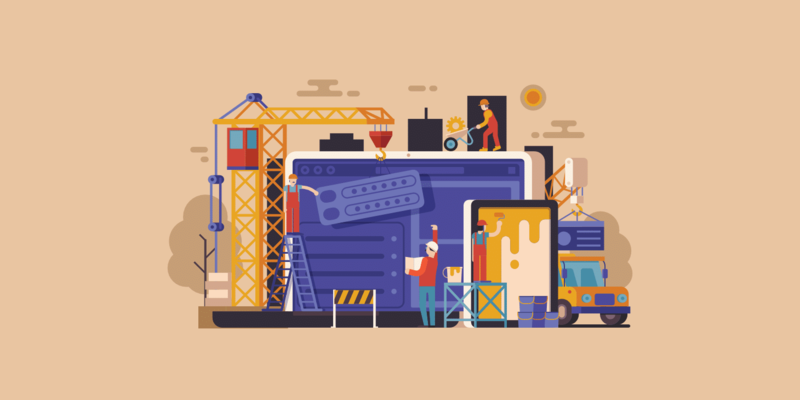 From basic free plugins to frameworks extendable by premium add-ons, you can use WordPress to manage all of your projects, clients, vendors, and suppliers. The best project management plugins are easily integrated into any theme or environment. You never have to leave your WordPress dashboard! If you want to share your experience using any of these WordPress project management plugins, please feel free to do so in the comments section below. Please note Freelancer says it does a lot of great things but according to the feedback reviews isn’t complete and doesn’t work as described. What I’d like to find Thomas is a project management plugin that integrates well with Buddypress Groups. Collabpress does with one exception. It conflicts with WPMdev’s Group Calendar plugin so their calendar doesn’t show in groups if you use Collabpress. Hi Joseph, have you tried contacting the two authors to check if they know about the problem and if they can resolve it somehow? Seems like that would be ideal for you! Hi Mark, yes well their support pages show they are not supporting their plugins. Thanks. Thanks Mark! I’ve found a few great php scripts that do a lot more than existing plugins. I’m going to see if I can either convert them to a plugin or integrate them with my existing site. @jsegal:disqus Can you share the PHP scripts you’ve found and are they helping? I am using collabpress and would like a little more functionality here as well. I decided to go with https://www.projectpanorama.com/ ..I felt it was by far the best option for giving the client an incredible experience, keeping the project on track, cutting down client communication time, and an all-in-one solution to organize every project, even my own, on one dashboard. Just amazing. You bet, Tom. Thank you for the awesome and organized information! It really helped speed up the process of finding the right Project Management system. I’ve used a few of the plugins on this list, and some are pretty nice. But honestly, I’ve had the most luck with one that isn’t included on the list: WP-Client ( site here: https://wp-client.com ). It’s essentially a client portal plugin, but I think last year sometime the developers released a project management “add-on” (extensions I think they call them). You can add-on this PM function for a price, or it’s included already with certain WP-Client license levels. I’ve had good experience with it, maybe some of you will also! 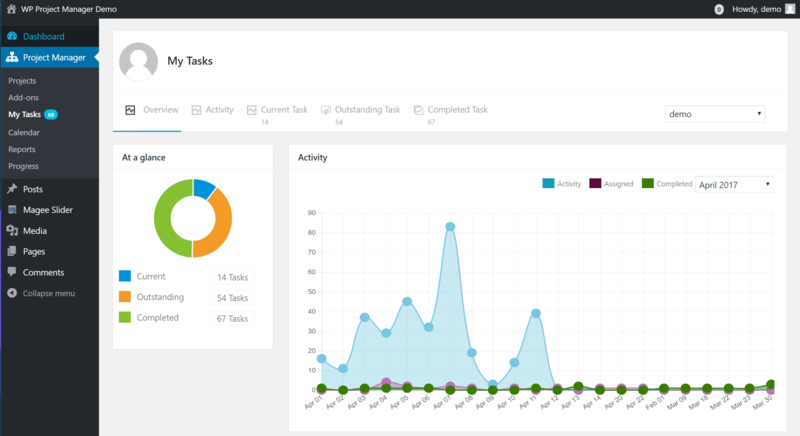 Consider WP-Client’s project management solution, which is nice because it provides a real overview of the project landscape, as well as my favorite “My Tasks” feature which consolidates all my tasks in one view, even if they all come from different projects. Plus, the solution is already built in to display to client privately via the client portal component. The support team is really good, and they’ve actually built in some features that my team specifically requested. Really a Good Listing. From above I used Projects Panaroma, but recently I found another one. I am thinking about to move on WP Project Manager by ThemeXpand, is there anyone used it? Hi Shameem. I too was using Panorama and moved on to external third-party solutions. Thinking of going back to WordPress Plugin so wondering about your experience this far with WP Project Manager. WP Project Manager simply doesn’t work they way they say it should unfortunately. Support take ages to reply and just say well that’s how it works. Annoying things like the Timer shows on the Client side and can be used by them?! And if you upload a file it doesn’t appear in the files section for the Client – only the work. I’ve spent several hours trying to set it up and it should be so good but sadly is not. I bought it because I wanted to integrate with WooCommerce etc but I am now trying to find another solution. Easy to use, time management, free and great design! Looks great guys! We have added you to the post above. Thanks for the list, but #8, Orbis, is dead. #4, Freelance, hasn’t been updated in three years, so it’s also dead. Thanks for the update Standford! We should have this post updated with fresh content in the next couple weeks. Hi Standford, we have now updated the post with actively updated and current project management plugins for WordPress. Thanks! Looks great! But being such a new plugin we can’t recommend it quite yet. Keep up the great work though. Just tried to install this one. First thing I saw,- it removed my menu line on top. I uninstalled the plugin,- back to normal. Hey, Corey from Kanban for WordPress here. We’ll be launching all new version in July of 2018. We’re super excited. It’ll include a lot more features in the free version, and work even better for project management. You can read more about version 3 here https://kanbanwp.com/v3 Thanks! Hey Corey! That is great to hear. We love project management solutions. Make sure to ping us with the new features when it’s out.